CHC provides unmatched helicopter services that enable our customers to reach beyond. The team at our Karratha base have flown an additional 89 hours with 67 extra flights in the past two weeks, demobilising and re-mobilising multiple rigs off Australia’s North West Shelf. The Category 4 Cyclone Veronica hovered off the coast for more than a week in March, moving between the major iron ore port town of Port Hedland and the Pilbara gas and iron ore hub of Karratha. On Monday 18 March, the demobilisation started for Woodside, Jadestone, Santos, BHP and Vermilion Energy and continued through until Thursday 21 March. On Friday 22 March, the team also moved an aircraft to Carnarvon, some 640km (400 miles, 345 NM), to the south to provide medevac cover for the core crew on BHP’s installation and two installations that had disconnected from near Karratha and moved to Carnarvon. 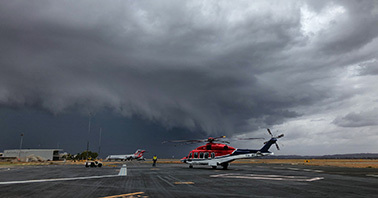 The team then had to wait it out while the top level ‘Red Alert’ was in place for four days as the cyclone would not budge from hugging the coast line. Finally, on Wednesday 27 March, the alert was downgraded and the team returned to the base. Thankfully there was only minor damage to the hangars, but the telecommunications lines were down. Unperturbed, the team proceeded to re-mobilise everyone back to the rigs using manual passenger manifests and hot-spotting to mobile phones for connection to crucial systems such as AMOS. Photo taken by Scott Park, one of our Licensed Aircraft Maintenance Engineers in Australia.